First things first, Forever Peace is not a sequel to Forever War, for that you need to look for the later novel Forever Free (expect a review at some point when time permits). 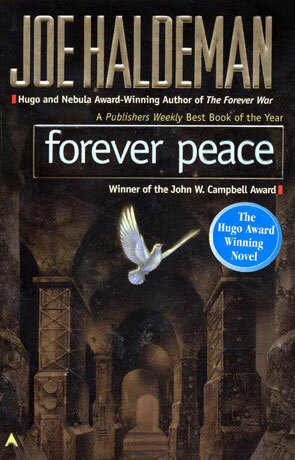 Forever Peace does however share a few of the same ideologies as it's predecessor and it also won both the Hugo and Nebula awards. Forever Peace is set in the year 2043 and in the west a war rages after a nuclear strike wiped out much of the American city of Atlanta. The US uses the high tech "soldier boys", almost indestructable humanoid machines that are directly controlled by "mechanics" linked up to the hardware and each other directly by use of a jack into the brain, located safely in bases hundreds of miles away from any real danger. For Julian Class the psychological strain of being "jacked-in" to his soliderboy and the horrors of war are becoming too much for him to bear. Then he and his companion Dr Amelia Harding make a startling discovery that could literally take the universe back to square one, a discovery that for Julian is as tempting as it is terrifying. The story Haldeman presents here is quite a powerful one, as ever he writes about people first but with some pretty forward thinking science fiction ideas thrown in. As with Forever War there is a distinct antipathy towards war and combat along with strong themes of sexuality which can be a little graphic at times (even to the point of gratuitous on the odd occasion) but the style remains vastly different. The book feels almost like a story of two halves too; there is a big reveal around half way through which is pretty much a game changer. It's also one that's quite unexpected, which I suppose is realistic but takes a bit of getting used to and throws you off your track. The characters however are completely compelling and it is very easy to begin caring about their lives, which play out in a pretty convincing manner. The author doesn't overly protect his creations either as some authors do and is quite happy to throw them into life-threatening situations. This means despite the paradigm shift you don't even consider putting the book down for a moment. There is also a very effective use of tension as the story gets going which builds towards the ending, keeping the reader on their toes right to the last paragraph. I loved the use of technology, the "soldierboy" units are inspired as is the use of the "jack" which is essentially a plug into the brain which allows the creation of an almost gestalt entity when people connect to each other with the sharing of not just thoughts a memories but also feelings, emotions and the very sense of "self". There is no doubt that Haldeman is a seriously talented writer, the story itself is a real work of literary art; at times there are subtle allusions that cast doubt over the whole story including the possibility of an unreliable narrator (narrated as it is from the first person) while at other times it really does provide some very real moments of thriller-lead tension. This all adds up to a classic moment is science fiction history, well deserving of the Hugo Award and also to be a part of anyone's collection. Written on 24th December 2012 by Ant.